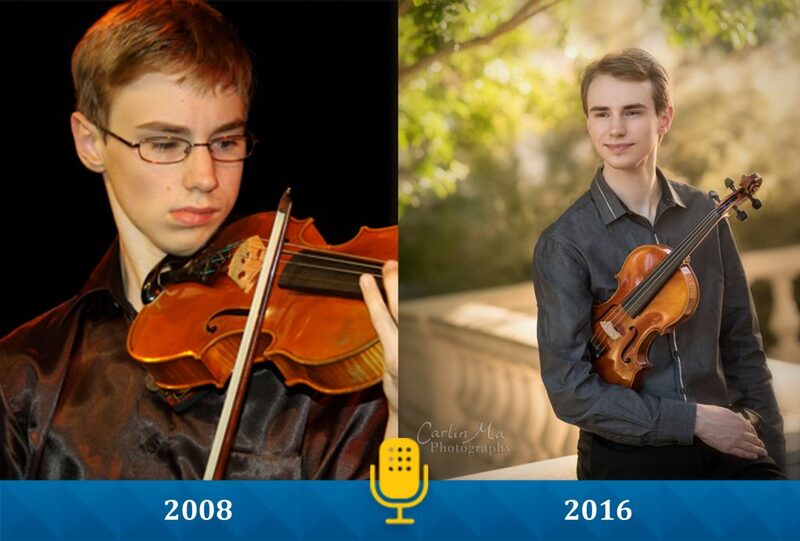 22-year-old violinist Kenneth Renshaw appeared on From the Top with Host Christopher O’Riley most recently on Show 228, recorded in February 2011. Previously he appeared on Shows 211 and 186. In conjunction with his first performance on the show in 2008, he received From the Top’s Jack Kent Cooke Young Artist Award. Here is what he has been up to since then, along with some of his thoughts on how the award has impacted his life. Kenneth Renshaw studied at New England Conservatory of Music for two years before transferring to The Juilliard School where all three of his teachers and mentors, including Itzhak Perlman, Donald Weilerstein, and Li Lin, teach. He also received the prestigious Juilliard Kovner Fellowship which provided him with a scholarship covering his full tuition and an additional stipend. Kovner Fellows benefit not only from financial support but also from significantly enhanced programmatic content with the goal of developing future leaders in the arts. After winning first prize in the Menuhin Competition in 2012, Kenneth was given many wonderful performing opportunities. Following the competition, he dedicated the next few years to focusing purely on developing his skills rather than entering numerous competitions. Three years later, he entered the 2015 Queen Elisabeth Competition (named for Queen Elisabeth of Belgium), considered one of the most challenging competitions of all, and made it to the final round. Kenneth explained that this competition was extremely grueling, but participating gave him tremendous confidence and increased his learning dramatically. Throughout, he has been periodically performing concerts as a soloist, participating in chamber concerts, and playing as part of an orchestra. “I don’t like to be just one kind of player. I want to do all of those things equally, and I hope it will continue that way.” Kenneth expects to graduate from Juilliard in December of 2016, and subsequently hopes to continue his violin studies in either New York or Germany. “I used my Jack Kent Cooke Young Artist Award to buy a new violin. I still have that violin and play it from time to time today, particularly for practicing. It was made by a living instrument maker-Ryan Soltis. That violin helped me in so many ways. First, I wouldn’t have been able to buy it without the funds. I was able to begin using it to play in recitals and competitions and with orchestras, and most importantly for my conservatory auditions. Wherever I went people asked about it, often thinking it was an older violin. After winning the Menuhim Competition, I was then loaned extremely valuable older Italian violins that were bigger in range. But in between those loaners, I’d still practice and play my own violin. Learn more about Kenneth and listen to him by clicking here. You can also visit his website by clicking here.